Edward William Earl was born at Darriwill, Sutherland’s Creek, Victoria on 21 October 1888. He lived in Geelong and originally attempted to enlist in Melbourne, but was rejected. Earl travelled to Adelaide and successfully enlisted on 7 February 1916. After a period of training with the Mining Corps at Mitcham, he embarked as a sapper in the 4th Tunnelling Company, on the HMAT Warilda A69 from Sydney on 22 May 1916. The Warilda arrived at Plymouth, UK, on 18 July 1916. Earl’s unit proceeded to France on 29 August 1916 and was absorbed into the 1st Australian Tunnelling Company on 30 September 1916. Tunnelling companies were primarily responsible for the construction of tunnels and mines to be used in action against the enemy. The 1st Australian Tunnelling Company was stationed at the mines under Hill 60, south of Ypres, Flanders, in November 1916. Hill 60 was a prominent feature in the low-lying landscape of Flanders and was fought over continuously. Explosives were laid throughout the tunnels to be detonated as part of the commencement of forward action. Tunnellers also listened in on the activity of the German tunnellers, who were often close by in their own mines. Once the explosives were laid, the tunnellers had to ensure that they were not discovered and defused before the planned attack. On 25 May 1917, German fire collapsed an Australian mine shaft almost directly above the main Hill 60 gallery. Earl and another Australian sapper, George Simpson, who were on listening duty, were trapped. Earl made his will and wrote a letter to his mother while entombed. He also continued listening to the Germans, but did not send his own signals to be rescued in case they were heard by the enemy and gave away the Australians’ position. Earl and Simpson were rescued on 27 May, after being buried for around 40 hours. Earl suffered from acute ascending paralysis as a result. 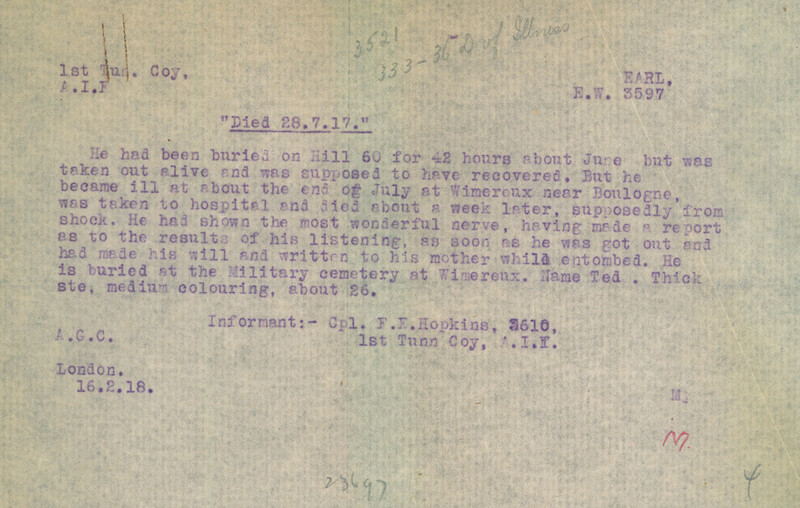 The paralysis caused his death by asphyxia on 28 July 1917 at the 32nd Stationary Hospital, Wimereux, France. He is buried at Wimereux Communal Cemetery.